INDIANAPOLIS (February 6, 2014) — Klipsch, a leading global speaker and headphone manufacturer, today announces a free gift with purchase promotion for the Klipsch Music Center KMC 3 and Klipsch Music Center KMC 1 wireless music speakers. Effective February 10 at U.S. retailers while supplies last, the brand will provide those that purchase the KMC 3 or KMC 1 with a free Klipsch S3m headphone ($49.99 value). 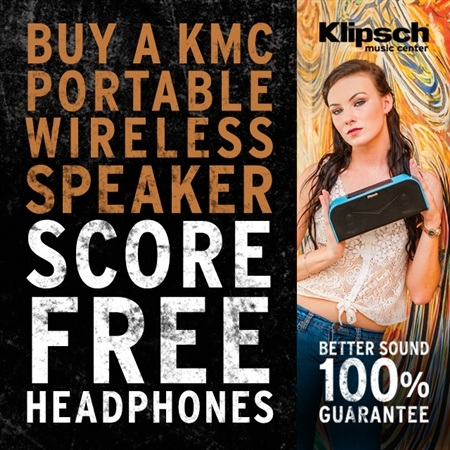 To receive a free pair of Klipsch S3m headphones after purchase of a KMC 3 (U.S. MSRP $399.99) or KMC 1 (U.S. MSRP $299.99) wireless music speaker, consumers can upload their receipt at http://www.Klipsch.com/KMCgift. After uploading, participants will be prompted to enter shipping information and choose their preferred S3m color option. The offer is valid beginning with receipts dated February 10, 2014 or after with a limit of one free pair of the headphones during the promotion. In addition to offering aesthetically appealing soft-feel paint, semi-gloss accents and jewel-like logos, the aptX® and Bluetooth enabled Klipsch Music Center KMC 3 presents a static or portable system designed for powerful, accurate sound reproductions. With dual 2-inch, full-range drivers and a dedicated 5.25-inch subwoofer, the KMC 3 system produces amazingly detailed output while creating deep, realistic bass. Completing the lifelike music experience is 130 Watts of peak system power enhanced by the advanced DSP equalization. Available in a black, white, blue, red or jade finish, the S3m accommodates listeners’ personal style while offering legendary Klipsch sound in a universally compatible product. Equipped with a one-button remote and microphone, smartphone users alike can play, pause and skip music tracks, as well as answer and end calls. Equipped with the patented oval ear tips for which Klipsch is known, the S3m allows for hours of comfortable, long-term wear. Unlike circular-shaped ear tips that put stress on the pressure points inside the ear, Klipsch’s patented oval ear tips naturally fit the contours of the ear canal, providing comfortable long-term wear.